One of the milestones in our Internet of Cultural Things-project (AHRC: AH/M010015/1) was the launch of artist Richard Wright’s Elastic System. With an interesting media archaeological angle, the art project creates an alternative visual browsing/search/request system on top of the existing British Library one. As an experimental pilot, this interface (an installation and soon an online version) returns the library to an age of browsable, visual access to books. While still in the middle of the 19th century the library space could be seen more as a public space with visual access to the collections, the modern storage and delivery systems at the BL created a different sort of a spatial setting. The sheer increase in the number of items in its holdings necessitated this change that could be easily seen as a precursor to the issues the more recent information culture has had to face: lots of stuff that needs to be stored, equipped with an address, and locatable. The short animation Knowledge Migration by Richard Wright is one way to visualize the growth in acquisitions on a geographically mapped timeline. The video is a short animation made by Richard Wright, showing “each item’s place and date of publication (or date of acquisition where available) since the library’s foundation in 1753.” Knowledge Migration used a random sample of 220,000 records from the print catalogue. The current reality of the British Library as a data institution can be approached through its infrastructure, also the many datasets and systems, including the ABRS (Automated Book Requesting System); this infrastructure includes both the data based systems and digital catalogues, online interface and searchable collections, their automated robotic systems in Boston Spa storage/archive space and also the important human labour that is part of this automated system. “ELASTIC SYSTEM is a database portrait of the librarian Thomas Watts. In 1838 Watts invented his innovative “elastic system” of storage in order to deal with the enormous growth of the British Library’s collections. The mosaic image of Watts has been generated from 4,300 books as they are currently stored in the library basements at St Pancras, an area not normally accessible to the public. Each one is connected live to the library’s electronic requesting system. You can view and use the installation system at the British Library in London until September 23, 2016 – it is located at the front of the Humanities Reading room (during library opening hours). The online version will be launched in the near future. Here’s Richard Wright’s blog post about his artistic residency at the British Library as part of our project: Elastic System: How to Judge a Book By Its Cover. We are discussing these themes in Liverpool on September 14, 2 pm, at FACT – this panel on cultural data is part of the Liverpool Biennial public programme. A thank you to Aquiles Alencar-Brayner (BL, Digital Curator) for the snapshots of the texts above. Update: This text is published inGerman in the Zeitschrift für Medienwissenschaft‘s blog, translated by Florian Sprenger. It is also published in Turkish in Biamag, translated by Doğan Terzi. Here is the original English version, which is also published on the Theory, Culture & Society journal’s blog. The particularly cruel scenes in Ankara and Istanbul from July 15th and 16th circulated quickly. From eye witness accounts to images detached from their context, media users, viewers and readers was soon seeing the graphic depictions of what had happened with the added gory details, some of them fake, some of them not. Still and moving images from the hundreds of streams that conveyed a live account of the events left many in Turkey puzzled as to what is going on. Only later most were able to form some sort of a picture of the events with the coherence of a narrative structure. By the morning the live stream on television showed military uniform soldiers raising their hands and climbing down from their tanks. What soon ensued were the by already now iconic images of public punishment: the man with his upper torso bare and the belt as his whip, the stripped soldiers in rows shamed and followed up by the series of images of expressions of collective joy as most of Turkey was relieved again. The coup was over. The unity in resisting the coup was unique. As it was summarised by many commentators: even the ones critical of the governing AK Party’s politics agreed that this was not a suitable manner of overthrowing an elected government. The flux of commentaries on social media and in newspapers, columns and television deserved its own name: “coupsplaining” as @shokufeyesib coined it. Also some rather established organisations like Wikileaks got quickly on the spectacle-seeking bandwagon of the coup attempt’s repercussions. Turkish journalists and activist soon read and revealed that the so-called “AKPleaks”-documents were not really anything that interesting as it was advertised to be. As Zeynep Tufekci summarised: “According to the collective searching capacity of long-term activists and journalists in Turkey, none of the ‘Erdogan emails’ appear to be emails actually from Erdogan or his inner circle” while actually containing information that could be considered harmful to normal Turkish citizens instead. In the midst of sonic booms, a different layer of sound was felt through the city: the mosques starting their extraordinary call to prayer and calls to gather on the streets. The latter aspect was itself triggered by multiple mediations that contributed to the mobilization of the masses. Turkish President had managed to Facetime with CNN-Turk’s live broadcast and to call his supporters to go on the streets to oppose the coup attempt. By now even the phone the commentator held has become a celebrity object with apparently even $250,000 offered for it. But there was more to the call than the ringtone of an individual smartphone. In other words, the chain of media triggers ranged from the corporate digital videotelephony to television broadcasting to the infrastructures of the mosques to people on the streets tweeting, filming, messaging and posting on social media. All of this formed a sort of a feedback-looped sphere of information and speculation, of action and messaging, of rumours and witnessing. Hence, there was more than just traditional broadcast or digital communication that made up the media reality of this particular event. The mosques started to amplify the political leadership’s social media call by their own acoustic means. Another network than just social media was as essential and it also proved to be irreducible to what some called the “cyberweapon” of online communications. As one commentator tried to argue commenting on the events in Turkey: “But, this is the era of cyberpower. Simply taking over the TV stations is not enough. The Internet is a more powerful means of communication than TV, and it is more resilient — especially with a sophisticated population.” However, there were also other elements in the mix that made it a more interesting and a more complex issue than merely about the “cyber”. During the coup weekend, it was the network of the mosques and their minarets that became suddenly very visible – or actually, very audible. While the regular praying times have become such an aural infrastructure of the city that one does not necessarily consciously notice it, the extraordinary calls from imams reminded how dense this social, architectural fabric actually is. The thousands of Istanbul mosques became itself an explicit “sonic social network” where the average estimated reach (300 meters) of sound from the minarets is too important of a detail to neglect when one wants to understand architecture as solidifying social networks in contemporary Turkey. In the context of mid-July it was one crucial relay of communication between the private sphere in homes, the streets and the online platforms contributing to the mobilization of the masses. The musicological perspective has highlighted how sound and noise negotiate conflict across private and the public and we can extend this to a wider media ecological perspective too. This is where art and design practices can have an instrumental role to play in helping us to understand such overlapped media and sensorial realities. Artists such as Arikan have investigated the ways how online tools and digital forms of mapping can connect to issues of urban planning and change. The visual artwork helps us to also understand how there are other social realities, less front of our eyes even if they are in our ears. This expands the wider sense of how media is and was involved in Turkey’s events, and it gives also insights to new methodologies of artistic intervention in understanding the coupling of media, architecture, visual methods and the sonic reality of urban life. And in this case of the bloody events of the coup weekend, much of the personal experience of “what happened” is now being narrated in Turkey in terms of what it sounded like – another aspect of the media reality of the coup attempt’s aftermath. Here’s Faxbook, a media archaeologically pertinent alternative to Facebook brought to you by Garnet Hertz and The Studio for Critical Making! The “social” and its current techniques like “sharing” was not invented only by the latecomer digital social media platforms and through the design intervention that Faxbook rescales the techniques to a different media technological system. The site for our new research group, AMT (Archaeologies of Media and Technology) is now live: http://www.southampton.ac.uk/amt/. Directed by myself and Ryan Bishop, AMT is located at the Winchester School of Art and is an “office for media theory and speculative practice in art & design”. The group will kick off with a range of activities after the summer including a small launch event planned tentatively for October even if we are already now involved in many things happening. The group builds on earlier work we have done with the transmediale-festival as well as many other links both in the School, in the UK and internationally. We have hosted various talks in these fields in the past years, including by Shannon Mattern, Alex Galloway, Lawrence Grossberg, Laurence Rickels, Olga Goriunova, Tony Sampson, Joanna Zylinska, Shintaro Miyazaki, Victor Burgin, Esther Milne, Pasi Valiaho and many others. 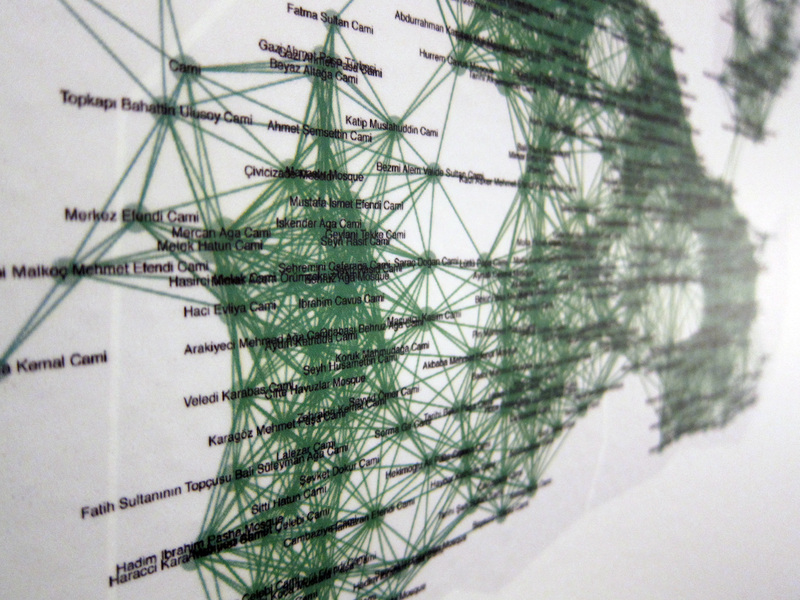 We have hosted events such as Media Theory in Transit and The Image of the Network. We will post more info during and after summer with events at WSA and through projects with our international friends and partners! We are happy to host Shannon Mattern at the Winchester School of Art. She is giving a talk on Infrastructural Tourism on May 3rd, at 12 – details below! The talk is organised by our Centre for Global Futures and the emerging new research group AMT – Archaeologies of Media & Technology, about which more information later. We seem to have come to a sudden recognition that the Internet is a place made of countless material things – cables and data centers and rare earth minerals. We’ve witnessed a dawning realization that our Amazonian consumptive appetites are dependent on similarly heavy logistical systems and exploitative labor practices. We’ve surrendered to the reality of the Anthropocene and its precarious infrastructural, environmental, political, and ethical futures. This emergent infrastructural intelligence has spawned an explosion of infrastructural “literacy” and engagement projects that seek to “make visible the invisible,” to call out the unrecognized, to bore into the “black-boxed.” Grand Tours of nuclear infrastructures and key sites in telecom history have inspired many a recent Bildungsroman, in myriad mediated forms. Apps and data visualizations, sound walks and speculative design workshops, DIY manuals and field guides, urban dashboards and participatory mappings, hackathons and infrastructural tourism – strategies employed by artists and activists and even some city governments and federal agencies – all seek to “raise awareness” among a broader public about infrastructure’s existence and its politics. They aim, further, to motivate non-specialist communities to contribute to infrastructure’s maintenance and improvement, to inspire citizen-consumers to advocate for more accessible and justly distributed resources, and perhaps even to “engineer” their own DIY networks. In this talk I’ll explore various pedagogical strategies, representational techniques, and modeling methods that have been employed to promote “infrastructural intelligence” — and consider what epistemologies, ontologies, ethics, affects, and politics are embedded in those approaches. Shannon Mattern is an Associate Professor of Media Studies at The New School. Her writing and teaching focus on archives, libraries, and other media spaces; media infrastructures; spatial epistemologies; and mediated sensation and exhibition. She is author of _The New Downtown Library: Designing with Communities_ and _Deep Mapping the Media City_ (both published by University of Minnesota Press), and she writes a regular column about urban data and mediated infrastructures for _Places_, a journal focusing on architecture, urbanism, and landscape. She has also contributed to various public design and interactive projects and exhibitions. This spring she is a senior fellow at the Internationales Kolleg für Kulturtechnikforschung und Medienphilosophie at the Bauhaus-Universität Weimar. You can find her at wordsinspace.net. For some years now, Winchester School of Art has been a (university) partner of the transmediale art/digital culture-festival. We took part this year again, with several panels and other events as part of the Conversation Piece-theme. One of them was the two day-workshop with artist, designer Burak Arikan (tr/new york) who ran a Graph Commons-workshop. We also had a longer conversation about his work, critical & collaborative mapping and more. You can listen to it as a podcast now. Part two of the Leuphana University and Brown University collaboration “Terms of Media” is taking place in October in Providence, US. I am extremely glad to be part of it, talking in the section “Remain”. If all goes as planned, the talk will move from the “remains” or “remainder” in the sense of the archival and the epistemological to emphasize issues of remains of media technologies in actioned situations. Remains are not merely of the archival, but part of a design brief with a hands-on relation to epistemology; labs, studios that address the remain as in the context of media archaeology but also design, sometimes implicitly, sometimes explicitly. The remainder becomes further detached from a nostalgic object to an issue that relates to contemporary ecologies of architecture, extended urbanism, supply chains and the “alternative worlds, alien landscapes, industrial ecologies and precarious wilderness” (Unknown Fields). I also will try to conclude with a mention of the methodological and thematic dilemma of infrastructural remains with a hat tips to Shannon Mattern and Unknown Fields (Liam Young & Kate Davies). Below more info about the conference! 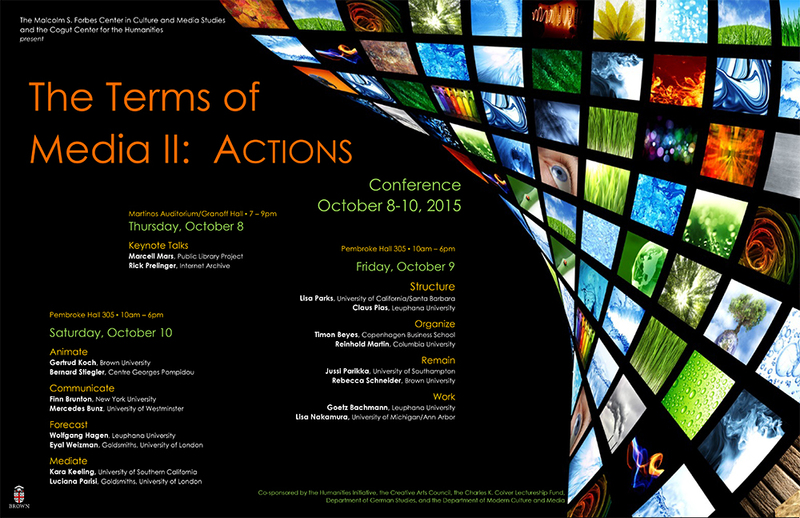 An international conference to analyze and reshape the terms—limits, conditions, periods, relations, phrases—of media. “Me­dia de­ter­mi­ne our si­tua­ti­on,” Fried­rich Kitt­ler in­fa­mous­ly wro­te in his in­tro­duc­tion to Gra­mo­pho­ne, Film, Ty­pewri­ter. Alt­hough this dic­tum is cer­tain­ly ex­tre­me – and me­dia ar­chaeo­lo­gy has been cri­ti­qued for being over­ly dra­ma­tic and fo­cu­sed on tech­no­lo­gi­cal de­ve­lop­ments – it pro­pels us to keep thin­king about me­dia as set­ting the terms for which we live, so­cia­li­ze, com­mu­ni­ca­te, or­ga­ni­ze, do scho­lar­ship etc. Af­ter all, as Kitt­ler con­ti­nued in his opening state­ment al­most 30 ye­ars ago, our si­tua­ti­on, “in spi­te or be­cau­se” of me­dia, “de­ser­ves a de­scrip­ti­on.” What, then, are the terms of me­dia? And, what is the re­la­ti­ons­hip bet­ween the­se terms and de­ter­mi­na­ti­on? This conference will serve as the concluding half of a two-part project, following an earlier conference at Leu­pha­na Uni­ver­si­ty in Lüne­burg, Ger­ma­ny, and will be followed by a se­ries of pu­bli­ca­ti­ons ba­sed on each which will seek to re­po­se and up­date these fun­da­men­tal ques­ti­ons of me­dia theo­ry: Does our si­tua­ti­on in­di­ca­te a new term, un­ders­tood as tem­po­ral shifts of me­dia­tic con­di­tio­n­ing, which de­ser­ves a re-de­scrip­ti­on? How and on what terms are me­dia chan­ging, re­flec­ting chan­ges in me­dia its­elf? What are the terms of con­di­ti­ons that we ne­go­tia­te as sub­jects of me­dia? How do the terms of me­dia theo­ry re­la­te to such con­di­ti­ons? What are the terms of con­di­ti­ons of me­dia theo­ry itself? Session 1: Structure, 10 a.m. – 11:30 a.m. Session 2: Organize, 11:45 a.m. -1:15 p.m. Lunch, 1:15 p.m. -2:30 p.m. Session 3: Remain, 2:30 p.m.-4:00 p.m. Session 4: Work, 4:15 p.m.-5:45 p.m. Session 1: Animate, 10 a.m. – 11:30 a.m. Session 2: Communicate, 11:45 a.m. -1:15 p.m. Session 3: Forecast, 2:30 p.m.-4:00 p.m. Session 4: Mediate, 4:15 p.m.-5:45 p.m.